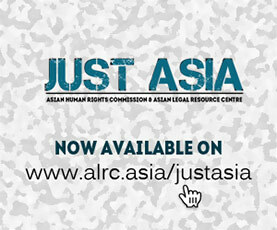 The Asian Human Rights Commission has received information that two peace activists who were a holding demonstration on May 28, 2008, against the tenth anniversary of Pakistans nuclear experimental detonations were arrested and one of them remains missing. According to the details received, the Baloch Nationalist Front (BNF) held a demonstration in front of the Karachi Press Club, on the occasion of the tenth anniversary of the nuclear detonations by Pakistan during May 1998. The nuclear tests were conducted in Chaghi, Balochistan, and a southern province of the country. Mr. Ghulam Mohammad, chief organizer of BNF and Mr. Abdul Wahab Baloch, chief organizer of Baloch Rights Council, were arrested after the peaceful demonstration when they were going to the office of Human Rights Commission, situated at Abdullah Haroon Road near the Karachi Press club, to discuss the issue of missing people in Balochistan. The demonstration was held to show anger against the tremendous usage of national resources on nuclear warheads instead of investing them on education, provision of drinking water and the elimination of poverty. The area where the nuclear explosions conducted was Chaghai in Balochistan where government denies every basic facility for the people of area including, drinking water, health care, schools, roads, employment and protection from nature. After the six nuclear explosions in the area of Chaghai the people are complaining of new diseases affecting the local residents, particularly skin damage and digestive problems. The demonstrators were chanting slogans against the nuclear bomb and demanding bread instead of nuclear weapons. The speakers, including both arrested persons, demanded the winding up of the nuclear programme. They accused the military and politicians of destroying their province by conducting nuclear experiments in Balochistan because of poor status of the province, instead of conducting nuclear explosions in Islamabad, the capital of Pakistan. The victim, Mr. Abdul Wahab Baloch, a known Baloch nationalist and peace activist, after his arrest was shifted to a lock up of the Central Crime Investigation (CIA) and after keeping him overnight he was shifted in the early hours of May 29, 2008, to some unknown place by a notorious red coloured double cabin jeep which was previously used in several cases of missing persons which bears no registration numbers. On 28 May 1998, Pakistan detonated six nuclear devices in the Chagai Hills in the Chaghai district, Balochistan in reaction to the five nuclear explosions from Indai in the same month. This operation was named Chagai-I by Pakistan. Pakistan’s fissile material production takes place at Kahuta and Khushab/Jauharabad, where weapons-grade Plutonium is made. The Chaghai is very remote area in the Balochistan province and even the water is not available. The local inhabitants have to rely on a rain which occasionally occurs. Please write the appeals (the sample is attached) by clicking the Blue button mentioned at the Urgent Appeal and also send faxes to the following authorities mentioned at the end of sample letter. Please demand from the authorities to ensure the release of Mr. Abdul Wahab Baloch who was disappeared after his arrest. Also demand to withdraw the cases against Mr. Ghulam Mohammad Baloch and Abdul Wahab Baloch. Please also be informed that the AHRC is writing separate letters to numerous UN and international agencies encouraging their interventions. 1. Mr. Abdul Wahab Baloch, Chief organizer of Baloch Rights Council Karachi-Pakistan. 2. Mr. Ghulam Mohammad Baloch, President of Balochistan National Movement, Karachi-Pakistan. On May 28, 2008, Baloch Nationalist Front (BNF) held a demonstration in front of Karachi Press Club, Karachi, against tenth anniversary of the nuclear explosions by the Pakistan during May 1998. The nuclear bombs were conducted in Chaghi, Balochistan, and a southern province of the country. Mr. Ghulam Mohammad, chief organizer of BNF and Mr. Abdul Wahab Baloch, chief organizer of Baloch Rights Council, were arrested after the peaceful demonstration when they were going to the office of Human Rights Commission, situated at Abdullah Haroon Road near the Karachi Press club, to discuss the issue of missing people in Balochistan. The demonstration was held to show anger against the tremendous usage of national resources on nuclear war heads instead of investing them on education, provision of drinking water and elimination of poverty. The area where the nuclear explosions conducted was Chaghi in Balochistan where government denies every human facility for the people of area including, drinking water, health care, schools, roads, employment and protection from nature. After the six nuclear explosions in the area of Chaghi the people are complaining some new kinds of dieses are spreading particularly skin damaging and weakening the digestive system. The demonstrators were chanting slogans against the nuclear bomb and demanding bread instead of nuclear war fares. The speakers, including both arrested persons, demanded to wind up the nuclear assets and asked the government to restitute the deposed judiciary. They were accusing the military and politicians for destroying their province by conducting nuclear experiments in Balochistan because of poor status of the province instead of conducting nuclear explosions in Islamabad, the capital of Pakistan. The victim, Mr. Abdul Wahab Baloch, a known Baloch nationalist and peace activist, after his arrest was shifted to lock up of Central Crime Investigation (CIA) and keeping him for overnight at the CIA lock up he was shifted in the early hours of May 29, 2008, to some unknown place by a notorious red coloured double cabin jeep which was previously used in several cases of missing persons and bearing no registration numbers. It is very disturbing that a government which was elected by the people is arresting people on the charges of holding demonstration on ‘peace’ and it looks that there is no difference between a military government and the so called civilian government. It is also very shocking that an elected civilian government is following the method of disappearances of activists which was a common method of previous military government. I urge to you to get the release of Mr. Abdul Wahab Baloch and bring the law enforcement authorities to the before the law to disappearing the peace activist.